Adin provides a wide range of digital signage solutions which were shaped by market demands through years of our presence on the DS market. Our development process relies on agile techniques with support for continues integration. We try to scale our products to satisfy customers wishes and various system conditions. System for content management, Adin CMS, Adin AdyInn and Adin AdyAds. System module for content management is DSMA extension which enables simple content management for various users with different access rights. Users can mutually collaborate in design of content that follows the predefined template. AdyInn module is DSMA extension that provides a simple content management interface for SME users / venue owners such as hair saloon or pub owners. It contains a predefined set of templates and samples, almost ready to be published. AdyInn in connection with AdyAds extends your screen to an advertising platform for advertising agencies. You can now earn additional money while still advertising your core product. 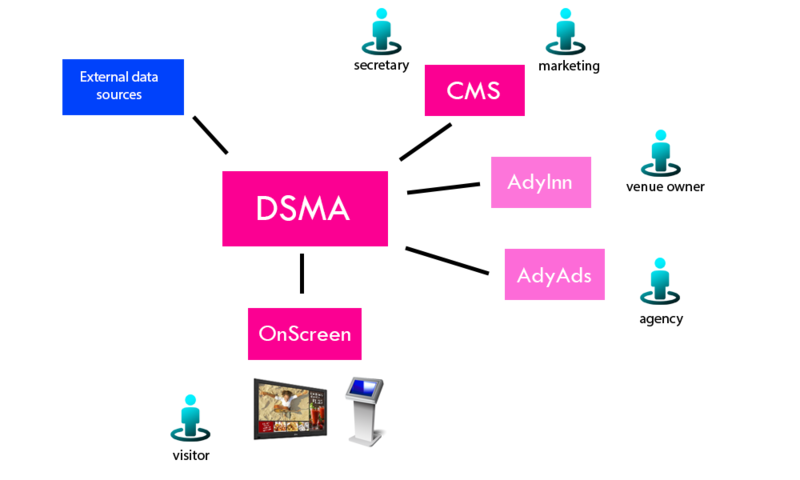 AdyAds module is DSMA extension built for advertising agencies. It helps them to easily distribute content and to select multiple advertising locations by various attributes like visitors demographics or area. User can start creating a campaign by filtering locations and then by inserting an advert, its length and number of appearances in the cycle. The selection equation gives the costs of the campaign. System provides a set of tools that help you monitor you campaign. Adin OnScreen is the payback application, which is installed on the playback device. Its main task is to communicate with central server, and media playback. OnScreen is built on web technologies, which enables a hight level of portability between different systems. It is designed for both dedicated STB plaback devices such as applications on plates and TVs. It is based on open sourve solutions and operates primarily within its own Linux distribution aimed at STB devices. Main unit on the location is a media player connected to display. It can be a standalone device or integrated into the screen. Through many years of being active on this market, we've tested many different products. We can offer products with the best balance between price and quality. Why not just my home PC or my tablet ? Media players usually have to do their job 24/7 all year. Content has to play smoothly, without jitter or errors. Kiosk touch devices have to lock or hide control buttons ( e.g. tablets 'Home' button ). We help you with the selection of screens of the right quality and size, following attributes such as usage intensity (full-time, part-time), luminescence of the surrounding area, angle and distance from viewer. Videowalls are becoming more popular every day. Reason lies in price drop due the new technological achievements like UHD resolutions and thin bezels (less then 1mm). Adin helps with selection of the right screens for the desired video-wall installations. We developed custom interactive kiosk solutions that can integrate camera or payment system. They are made with help of our external partners. We are reliable partner in advising, purchase, installment and maintaining outdoor and indoor LED screens. Advantages in using LED screens is in their modular setup that enables installments of various sizes and shapes. They can be used in any light conditions with highly adjustable brightness and contrast. Our team can help you from ideas to final setup of your LED screen. We provide maintenance and daily monitoring of the installed LED screen. Our complete solutions extend rental and network control services with content preparation and creation of custom templates. We also help you with choosing the best installation plan and design. Your DS network can be built in Adin cloud with help of pre-installed content management modules. Hardware can be purchased or rented. You can also use your own hardware with our OnScreen application. Both, software and hardware can be rented or purchased. To install central application DSMA with CMS extension, you have to provide minimal system requirements. DSMA works on Linux and Windows platform. It is written in PHP and ships with Microsoft SQL Server or Postgres database instance. It can utilise three different web servers, Nginx, Apache and Microsoft IIS. We create custom templates for our customers. Template is a layout or matrix of content regions. Each region can contain a message from diffrent group of users. Template usually follows your corporate design with set user rights on particular region. In terms of architectural planning we provide design plans for videowall mounts, shop-in-shop desks, click&collect kiosks and other.